ARRoc is sponsoring a vegan potluck (6:30 pm) followed by a talk and guided meditation by Ramana (7:30 pm) on Thursday, April 20th at the Rochester Academy of Medicine, 1441 East Ave., Rochester, NY 14610-1665 (many thanks to Rochester Lifestyle Medicine for offering their space to us!). Ramana’s talk will be about Healing for Vegans. Do you find your thoughts looping on what you have learned about animal suffering? Do you feel depressed and anxious about the scope of violence inflicted on these helpless victims? Whether it’s remembering the violence you’ve witnessed, being reminded of the violence by seeing animal “products” almost everywhere, or experiencing sadness and frustration over the lack of understanding among those you love of what seems so clear, Ramana helps you create space and expansiveness in the midst of trauma, so that you can feel it, experience a connection to it, and let it pass through you. He helps you give the sadness somewhere to go. Among other things, Ramana tells Hindu stories about the gods teaching us not to eat animals. It is comforting to hear these ancient teachings resonating through the centuries with what we live now. Guided meditations are an accessible way to help find peace in the noise of our lives. Ramana, a best-selling author, has been teaching and maintaining a private psychotherapy and healing arts practice since 1978. He now resides in both New York and India. 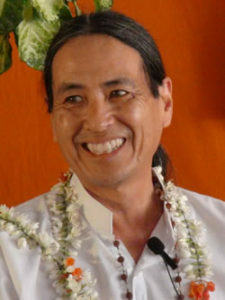 Since 1997 he has traveled full-time throughout the U.S., Canada, and the East sharing his work, Radical Awakening and the Opening to Heart Consciousness, and has trained hundreds of practitioners to continue his work. Vegan potluck: All items contributed to the potluck must be vegan please; if you are at all unsure what that includes, please contact us. Please bring a list of ingredients, a serving spoon, and your own complete table setting. It helps us plan if you RSVP. Thank you!